Belong to the Fringillidae (Finch) Family yet look completely different. 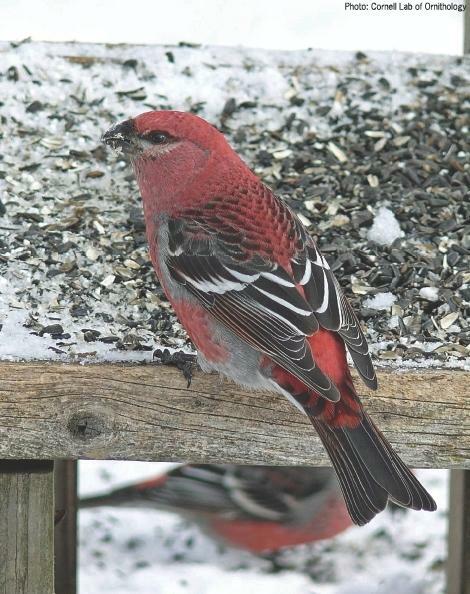 Pine Grosbeaks are a large robin-sized, heavy-chested finch with a round head. They have a thick, conical beak that has a small hook at the tip, but is much stockier than in other finch species. Males are reddish pink, females are reddish-orange and grey birds with dark grey wings marked by two white wing bars. In the winter they form small groups of up to 30. These flocks may also include Bohemian Waxwings. They travel together in search of seed and fruits from spruce, pine, juniper, mountain ash and other berry-producing shrubs. Pine Grosbeaks especially like crab apples. They often showing up at bird feeders filled with black oil sunflower or suet. In the summer they add insects and spiders to their diet. Since the plant material is hard to feed the nestlings, they regurgitate vegetable matter mixed with insects that they store in a pouch in the lower part of their jaw. Pine Grosbeaks aren't just in North America. They also are found in subalpine evergreen forests from eastern Asia to Scandinavia. Although, they are mainly found in Canada, they inhabit the northern tier of the U.S. in higher elevations. In winter they can be found in deciduous stands in the valleys. When boreal tree species produce large seed crops, Pine Grosbeaks raise more young and are more likely to survive the winter. But when the trees fail to produce enough seeds the following year, the increased population of grosbeaks irrupts outside the normal breeding range to find food. During irruption years, birds travel further south in search of food. They are especially tame and approachable. Keep your eyes and ears open when you are skiing or cutting your Christmas tree, you may be lucky enough to see a band of Pine Grosbeaks. Happy Birdfeeding!